I will be presenting with several other anthropologists on the ethnographic research methods we used in our foodways research at this month’s AAA (American Anthropological Association) Annual Conference in Chicago. These methods should help other researchers when they encounter discrepancies between what people say they eat and what they actually eat. I will be talking about the surveys I used for my research on the food rituals, beliefs and post-race binging of competitive triathletes and marathon runners. This being my first AAA conference and first AAA session presentation, fortunately for my nerves, it will be before the Thanksgiving holiday. The session where we will be presenting our food research methods is called Foodways in Discourse and Practice: A Discussion of Ethnographic Methods. It will be held on Sunday, November 24, 2013, 12:15 PM to 2 PM in Conference Room 4L at the Chicago Hilton. For more information about this years AAA conference, please go to the “2013 Annual Meeting Central” section of the AAA website. Triathlete winner of 2007 Carpinteria Sprint Triathlon enjoying a post-race binge. In this research project I discovered the multiple disjunctures between the pre vs. post-race foodways beliefs and practices of triathletes and endurance runners in California. I also discovered the ideal body types and food beliefs of these endurance athletes and how these ideals are influenced by scientific hegemony and an American fitness culture of embodied elitism, health and morality. Using the symbolic interpretive technique of Lévi-Strauss’ binary oppositions to tease out “good/bad” foods and body types I analyzed how these ideals are actually employed in day-to-day nutrition and eating practices using Bourdieu’s practice theory and concept of cultural capital. In regards, to race rituals (and rites of reversal which occur during a race event for some participants) I used Turner’s theory of how rituals serve to reproduce the values and practices of cultures and maintain group solidarity. I also analyzed through self-reported symptoms of physiological stress response on how these rituals, which included binging on carbohydrate-rich foods, may be reinforced as techniques of stress hormone reduction. Research methods I used include participant observation—doing the workouts with my triathlete and runner informants and participating in two races, in-person semi-structured interviews, and online surveys. I found my nearly 150 respondents through the membership of two local competitive triathlon and marathon training clubs, informal networks of friends and friends-of-friends of triathletes and competitive long-distance runners as well as informal networks of online followers of a twitter profile which I set-up for this project. The results of my research illustrate how useful some of these “old” classic theories of anthropology still can be in current research of both cultural ideals, identity and as well as the biological effects/functions of nutritional practices. Here is a copy of the Spring 2009 research survey that I used for my research on discovering the possible reasons behind the disjunctures of what runners say they eat and what they actually put in their mouths during a post-race celebratory meal: “Runners Pre-Race/Post-Race Survey” [PDF]. 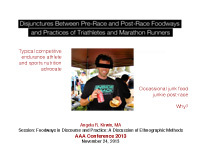 Here is a copy of my research analysis (un-published paper) of which my presentation at the AAA was based: “Post-Race Food Cravings and Food Consumption of Endurance Runners” [PDF]. The other presenters during this food research methods session at this year’s AAA conference have some great perspectives and methods to share from their own research areas. They include the session’s organizer PhD Candidate Amber O’Connor from The University of Texas at Austin and her presentation “Obviously Imperceptible: Identity and the Tortilla in Quinta Roo.” O’Conner applies Bourdieu’s practice theory to the complexity of identity formation in her ethnographic research in a Maya village in Mexico. Graduate student Tylor Short of the University of Louisville will show how to discover the reasons behind a consumer’s performance of morality-based food choices with his revealing research on public versus private coffee consumption using dietary recall surveys and questionnaires. All three of these presentations illustrate the importance of participant observation as an invaluable research method for verifying survey data. It was the observations of each anthropologist that revealed the discrepancies between what people said they ate and documented in the surveys they completed and the foods that they actually consumed–the reason for the discrepancies. This research methods session should be of particular interest to anthropologists working in the private sector as consumer research professionals in the food industry or in the public sector in the arena of public health research as well as anthropology instructors and students.